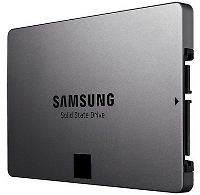 Samsung Now Has a 16 TB SSD Drive! Oh. Wow. 16 TB in an SSD! Want. Need. Drool. PC World – By: Jared Newman – “Samsung has figured out how to supersize solid state storage with a whopping 16TB SSD. At that size, Samsung has taken the lead for world’s largest storage drive, even compared to hard disk storage. Last year, Seagate and Western Digital released 8TB and 10TB HDDs, respectively, while Fixstars announced a 6TB SSD just a few months ago. Samsung’s new drive fits within a 2.5-inch enclosure, so in theory it could find its way into laptops and desktop PCs. As usual with insanely large storage drives, however, Samsung is targeting the server market first. At this year’s Flash Memory Summit, the company showed off 48 of the new drives in a server with storage totaling 768TB, Golem.de reports. The drives are fast as well, rated at two million input/output operations per second. As Ars Technica notes, conventional PC drives tend to handle 10,000 to 90,000 of those operations per second. That’s not to say Samsung will stay king of the storage hill for too long. Earlier this month, SanDisk announced its own 256Gb, 3-bit-per-cell, 48-layer 3D NAND flash chips in partnership with Toshiba. While they haven’t announced any products yet, SanDisk said last year that it was hoping to launch a 16TB SSD in 2016.